Indeed blessed and noble is the soul who, inspite of all great achievements, is rooted in goodness, humility and considers the opportunity to serve others as the greatest wealth. They have the ability to wear the crown of power and authority, not with hubris, but with a grace and detachment that adds glory to the position itself. Such humans are hard to come by, and even when they do, they may miss our cursory vision. But, we have been fortunate in that, Bhagawan, in all His mercy, has called our attention to few such noble contemporaries so we may observe them, be inspired and strive to emulate them in our quest to become better human beings. And Bhagawan does so by showering a special, warm love on these individuals, observing which we may sit up and wonder, what is it in the nature of this person that has entreated such grace. One such life was that of Bharat Ratna, Sri Atal Bihari Vajpayee who left the mortal coil on Aug 16, 2018. 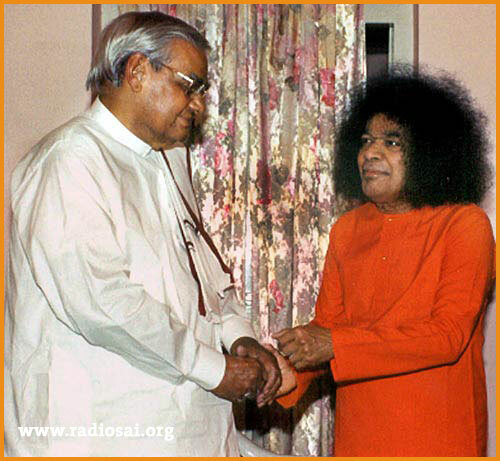 Being a staunch follower of the Sanathana Dharma and an ardent believer of the Bharatiya culture, it is not surprising that he fell in love with Bhagawan Sri Sathya Sai Baba in the early 1970s. In fact, he was an active participant and the chief guest of the Summer Course in Indian Culture and Spirituality, held in Swami’s ashram at Whitefield, Bangalore, in 1978. He was then the external Affairs Minister in Prime Minister Morarji Desai’s cabinet. 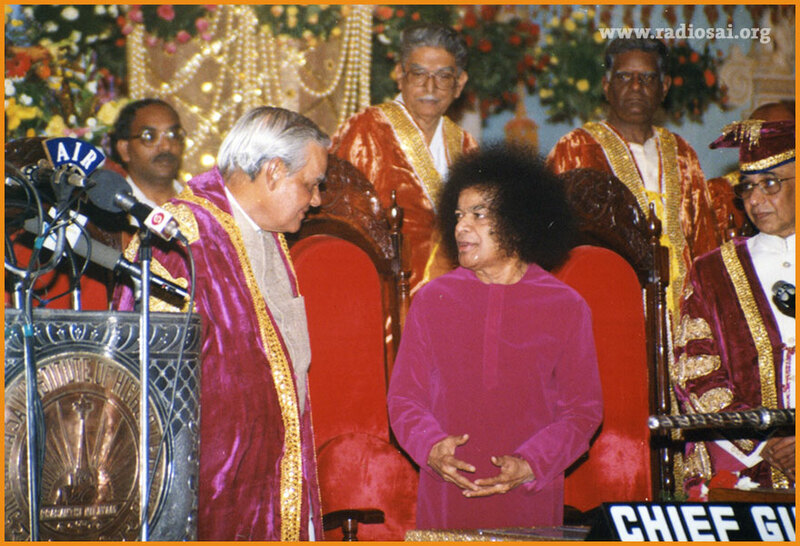 His association with Bhagawan and Swami's special love for this devotee began ever since, or rather became visible for all. “He missed his flight and therefore stayed back at the college guest room which was modest at best, considering his stature. The next day, when the students went to give him coffee early in the morning, he was missing. One of those days, Swami took him by surprise when He told him that he would one day be the Prime Minister of India. At that point in time, Vajpayee’s political party, the Jana Sangh, had just two seats in the 545-seat Indian Parliament! The idea of him becoming the Prime Minister appeared a bit too farfetched then. But he accepted Swami’s words with great reverence and humility, and was moved to tears. He continued to think, speak and work for his motherland. He also continued to visit Swami whenever he managed to find time, which was hard to come by as he took up multiple political responsibilities. Mr Vajpayee was the Chief Guest at the 17th Convocation of SSSIHL held on Nov 22, 1998. During his convocation address, Mr Vajpayee, then the Prime Minister of India stated, "The Indian tradition believes that Truth or Sathya is God. As the Sai model of education affirms, the students of this university are not just students, but seekers of Truth. The divine guidance of Bhagavan Sri Sathya Sai Baba has, thus, elevated even education to the level of worship of God". 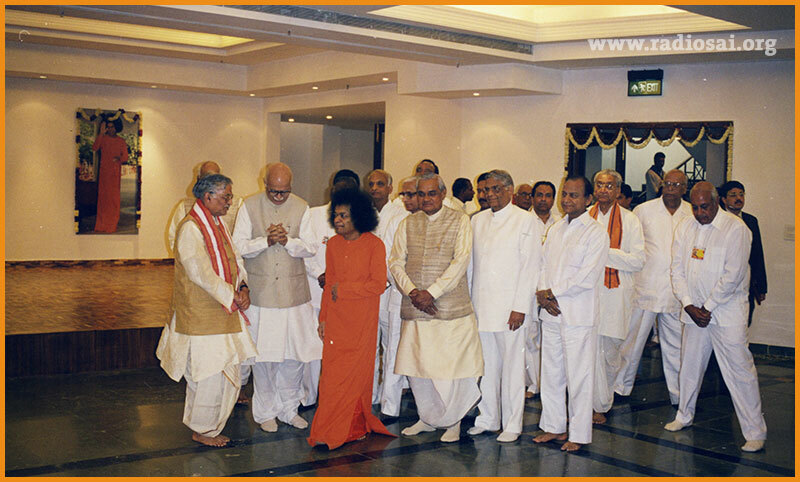 Swami always presented Mr Vajpayee as a true Brahmachari - one who is in the quest for Brahman. “He did not want to get married and get distracted into Samsara. It is not a path for normal mortals”, Swami would often tell the students. The country saw progress and prosperity, initiative and industry, distress and development during his three terms as the Prime Minister. Though his first two terms were short-lived, during the third Vajpayee achieved the daunting task of holding together a fragile coalition that was the first non-Congress government to complete its term of five years. He built up his party, the BJP into a force-de-majeure in the Indian polity. The foundation for all that was his devotion to Swami whom he kept visiting for recharging his batteries. He retired from active politics in 2005 and began to dedicate more time to his spiritual growth. A time then came when he was no longer able to travel to Swami. In 2009, he suffered a stroke which impaired his speech. How could Swami hold back? 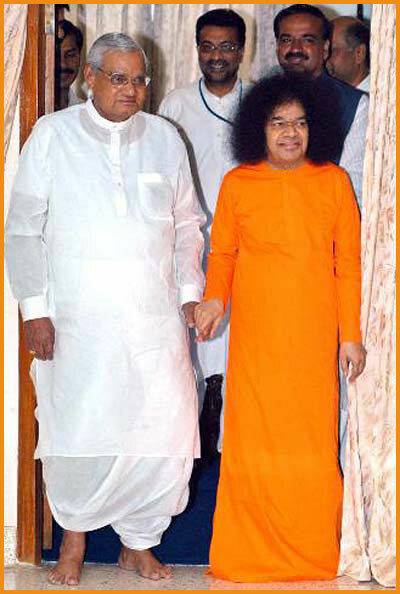 On April 12, 2010, during His visit to the capital city of Delhi, Swami paid an ‘unscheduled’ visit to Mr Vajpayee at his residence. 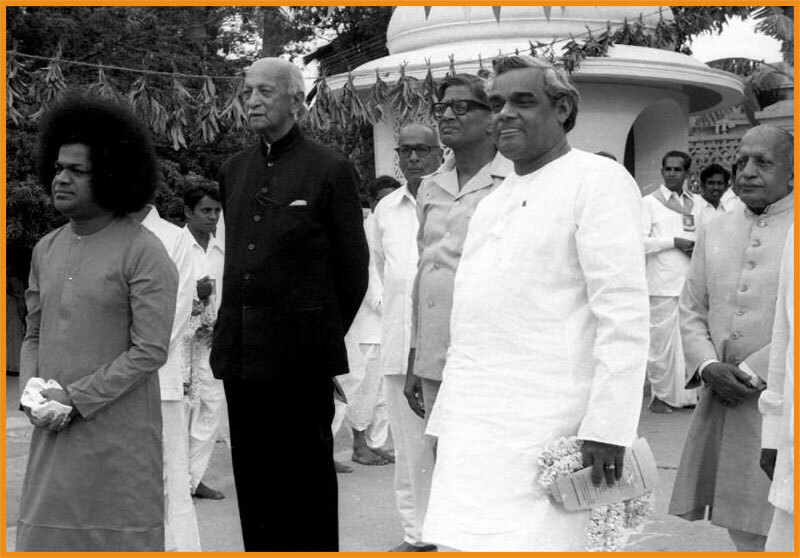 Though the students who had accompanied Swami to Delhi didn’t go along, they could judge the joy Vajpayee must have received by seeing the joy Swami Himself exuded after meeting him. After all, isn’t the devotee and the Lord a reflection of each other? It was possibly the overwhelmed response of a devotee who did not want to remember anything else after this interaction that Vajpayee soon ‘suffered’ from dementia. He was now surrounded by Swami through His pictures which adorned almost all walls in his room and home. That was how it was till his final moments too. 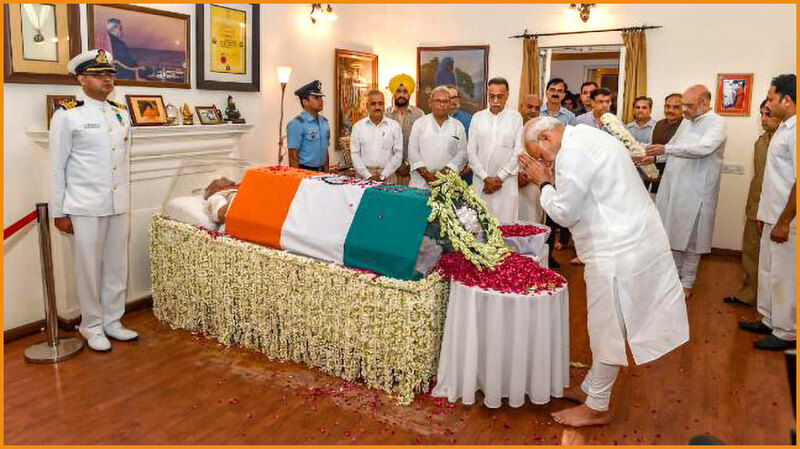 And when the nation (and several nations across the world) paid rich tributes to him after his death on the August 16, 2018, two pictures of Swami stood in their frames behind him. No wonder that the great man and humble devotee offered Swami a place at his head when he left the mortal coil. It was symbolic of the permanent place in his heart that he had offered to Swami and the permanent place he had won in Swami’s heart. In 2001 when Swami's second Super Speciality Hospital was ready for inauguration, He expressed His wish that Mr Vajpayee be invited to inaugurate the hospital. 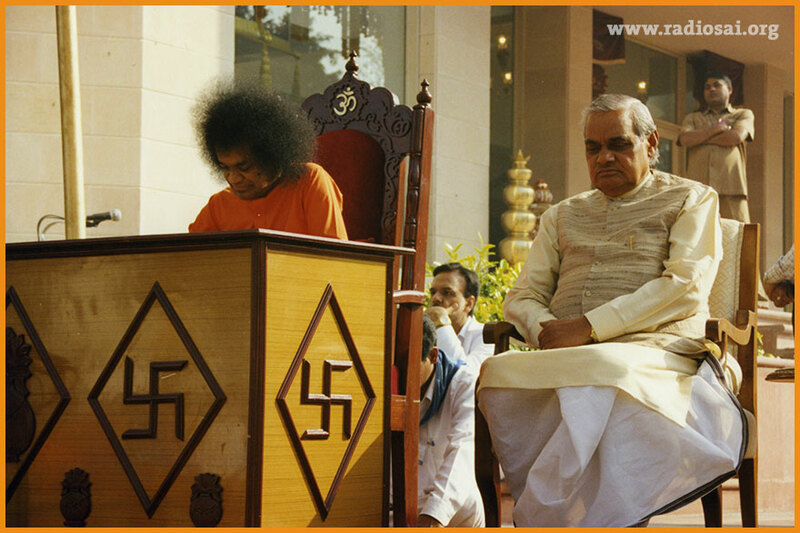 That is how on Jan 19, 2001 Mr Vajpayee was again beside Swami, this time as the Chief Guest to the inaugural ceremony. Even as we remember this great son of Bharath and the special place he had earned in Swami's heart, we wish to present for you the edited transcript of the talk he delivered on that occasion. 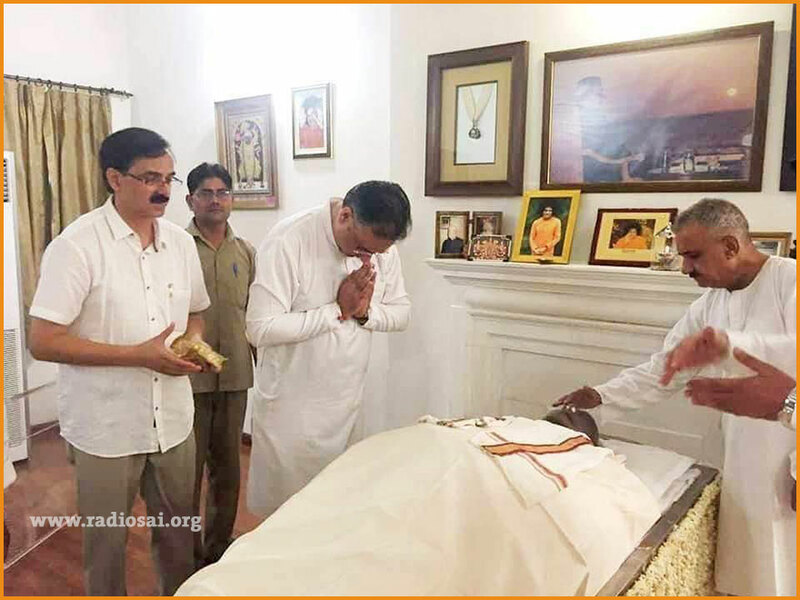 We pray that Mr Vajpayee rests in peace at Swami's lotus feet. Bhagawan Sri Sathya Sai Baba, Governor of Karnataka Smt Rama Devi, Chief Minister of Karnataka Sri S. M Krishna, Chief Minister of Maharashtra Sri Vilasrao Deshmukh, Sisters and brothers. Before I begin I would like to apologise for the long delay in my arrival here. I had to attend two other functions this morning, they went on longer than expected. I would like to thank you all for waiting so long and so patiently. I know you have been waiting for Baba not for me! I am honoured by Bhagawan Sathya Sai Baba's decision to invite me to inaugurate this magnificent temple of healing that He has built in the capital of Karnataka. I have visited His Temple of learning at Prasanthi Nilayam several times. I have also seen His Super Speciality Hospital at Puttaparthi. I had then remarked to myself that the people of Andhra Pradesh are lucky to have such a magnificent Hospital. I am glad that in neighbouring Karnataka too can now share in the spiritual and physical well-being that Bhagawan generates. Friends, I have seen many hospitals in India and abroad. In some of them I have also been a patient. As was the case most recently at Breach Candy Hospital at Mumbai. However I can honestly say that I have rarely seen a Hospital so magnificent, so grand and so breathtakingly beautiful as this one. When I first saw the photographs of this Institution I told myself that this cannot be a Hospital. Rather it looked like a palace, but a palace with a difference. A palace of healing that is equally accessible to the poor as it is to the rich. I used the word palace deliberately. For Baba's is truly an empire of the soul, an empire that, that knows no national boundaries. And no divisions of caste, creed or colour. From what I know of the meticulous care with which Bhagawan runs every Institution of His. And He runs an incredibly large number of them. I am confident that the insides of this Hospital will more than match its outsides. As always He has assembled a team of the best doctors and the staff. Again as always many of them are voluntarily offering their services to Baba and to the people. The high domed prayer and meditation hall in the centre of the building alone makes this place a unique combination of Temple and Hospital. It will surely generate tranquillity and hope in patients’ minds. Sanctified by divinity it will encourage the curing of diseases not merely of the body, but of the mind and the spirit as well. Friends, to me what makes this Hospital unique is the largely free services by which the poor too will get the same five-star healthcare as the rich do. There are many private hospitals in our country in big cities whose doors are closed even to the middle class. The rich too will be a good deal poorer in the wallet when they take treatment from these hospitals. By setting up this Hospital, Baba has shown that just as the doors of a temple do not recognise the feet of a rich or a poor. So too should a good hospital offer services to all those who need them. Baba's ideal which is also my ideal is best expressed in a Sanskrit shloka. Na Tvaham Kamaye Rajyam Na Swargam Na-punarbhavam. It means, I long for neither a state power, nor for heaven or reincarnation. My only desire is to see that the sufferings of all living beings are removed. Friends, the present healthcare system in our country is a far cry from this ideal. India is still only about five hospital beds per 1000 population. We have also have only six or seven physicians per 1000 population. As a result a majority of over population is still serviced by practitioners of traditional medicine or by those who are not adequately trained. Nearly seven lakh children die every year due to diarrhoea which is easily preventable. More than half the number of pregnant and lactating women are anaemic. No wonder for the poor healthcare accounts for among the largest chunks of their meagre family budget. It is now obvious that governments’ resource alone cannot suffice to meet the healthcare needs of our growing population. We have to think, adapt in alternative innovative ways to achieve our objective of health for all. We need to radically revamp the government run healthcare system to make it more effective and efficient. We need to create greater linkages between public and private healthcare systems. The government would like to encourage more private sector investment in secondary and tertiary healthcare. At the same time I would like to see private practitioners and private hospitals carry a significant share of the burden of public healthcare. But whether a hospital is in the private sector or in the government sector it can promote the public good only if the people working in them are guided by the overriding principle of seva. And this is where we can all learn from the Institutions of Baba. One of Mr Vajpayee’s first visits during the Summer Course in Indian Culture and Spirituality held in 1978 at the Brindavan Ashram. Also seen (in black suit) Field Marshal General Cariappa, first Indian Commander-in-Chief of the Indian Army. The darkness that threatens can be dispelled, for this country is destined to become great. We have a mission; we can show the way to the world, provided we ourselves go that way. The Summer Course on Indian Culture and Spirituality must have impressed on you, the new generation that it is Dharma that matters and not just the accumulation of degrees and diplomas. These may help you to earn money, but they cannot bring peace. Under the inspiring leadership and guidance, the moulding of new generation on right lines, is already on. You are the pioneers. Take the message of Love, compassion, and fellow‑feeling to every part of the country. He attracts the most qualified and competent professional to work in His colleges and hospitals. But what impresses us is not only their qualifications and expertise, it is also the humble self-effacing and devoted service that they render to one and all. We need this combination of professional excellence and service orientation in all walks of our national life. In healthcare as well as education, in industry as well as administration. The task of providing quality healthcare to one billion people is by no means an easy one. It cannot be met by over dependence on the curative approach which is neither affordable nor accessible to many of our citizens. Even rich nations are finding it difficult to sustain their expensive healthcare systems. It is therefore necessary for India to promote preventive and community-based healthcare. As is well known, prevention is always better than cure. Unfortunately, preventive medicine in our country has so far been largely neglected. In the case of some diseases like HIV, AIDS, prevention through awareness is the only medicine. We also need to sustain the campaigns aimed at educating the people about the basics of healthy living, a good diet and exercise. To start with we should promote cleanliness in public places in a big way. One of the many things that impresses me about Baba's Institutions is how spotlessly clean every nook and corner is, although thousands of people visit them every day. Here too we can learn from Baba and His devotees. To make effective and affordable healthcare widely available, we also need to give greater encouragement to Ayurveda, yoga, other Indian systems of medicine and homeopathy. Unfortunately, these indigenous systems have not yet found their rightful place in our overall healthcare strategy. 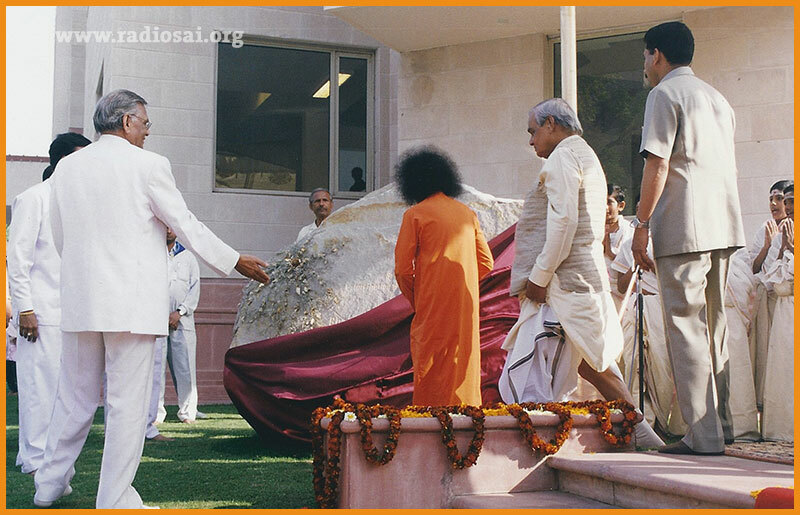 Prime Minister Vajpayee and other dignitaries with Bhagawan during the inauguration of the Sri Sathya Sai International Centre, New Delhi during Bhagawan’s Delhi visit 11-14 Mar 1999. Also seen, Mr Murali Manohar Joshi, Mr LK Advani and Mr Ashok Singhal. Our government has been doing much to correct this imbalance. I agree however that we need to do much more. Before concluding I join all of you in wishing this Institute the very best. May all the future plans come through. And may it quickly become a sacred symbol of Baba's generosity to the people of this country. I would like to say a few words in Hindi too. We visit a hospital for medicine. But when the person's condition becomes quite bad, when the doctors drop their instruments (give up), when hope turns into despair, then medicines (dava) can help no more, only divine blessings (dua) can. This is one hospital where you can receive dava and dua, medicines and blessings! Here you have competent doctors like Dr Venugopal, you also have a Divine Being in Bhagawan, who with His blessings can relieve the people of their distress. Thank you so much!